Part 2 of our DIY SEO guide. Now that you have a starter keyword list to go from and a base line for analytics, it's time to finesse the website itself. We'll go over a few higher-level tips first that are important to bear in mind, then get into the nuts and bolts of writing optimized content. You're using a modern design template built for newer displays (not 800x600 monitors from many years ago) and that is mobile-friendly. If you don't have a design that displays well for mobile users, we need to address that first before the SEO. You've done some preliminary keyword research as discussed in Part 1 of our DIY SEO guide. And remember: SEO isn't really about doing one or two things that create night and day differences. It's about getting dozens of little things right, things that have a cumulative effect that become notable together. Since we've mentioned both titles and H1's, let's define them both quick before we move on. The page title is self-explanatory as the bit people see on each page or article. 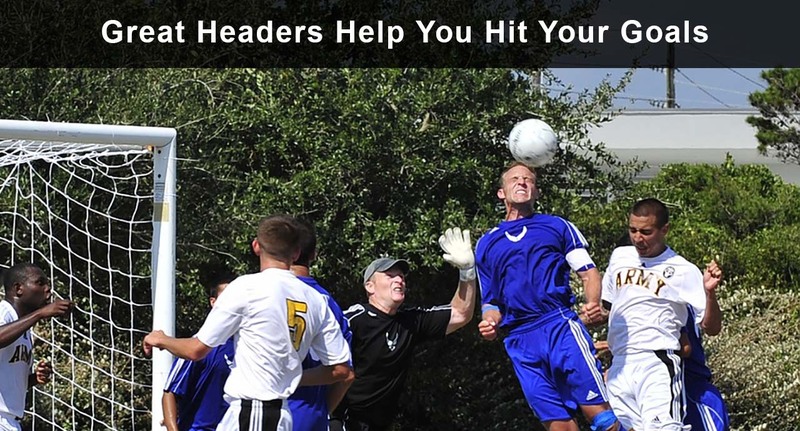 Headers are important visually and for SEO, and it's important that your theme is setting your page titles as H1's. Most modern themes do this properly, but you want to make sure you don't have multiple H1's per page. Put another way, each page or post should only have one H1. Some blog themes that list the most recent posts on the front page, for example, use each post's title as an H1. Then you end up with a front page with a bunch of H1 tags, which confuses search engines. Google and Bing are looking at the H1 tags to determine what the page is about, and when there are multiple it hurts your rankings because it makes the answer to that question less clear. Your page title should always be clear, and should always contain some form of the keyword you'd like that page to rank for. Since search engines are looking heavily at the page title to determine what the page is about, this is a big opportunity to establish ranking clout for that topic. When possible try to put your keyword as close to the beginning of the title. That further helps affirm it to search engines. However, if we follow our people first rule of SEO we should only do this when it makes sense contextually. If trying to get that keyword in the beginning of the title makes it sound wonky or confusing, having it somewhere further in is okay. "Why you need expert plumbing services" is weaker than "Expert plumbing services: trust our 25 years of success" from an SEO standpoint because the keyword is at the end. However, if you've already created a few pages with the latter format it's OK to do something different for a better user experience. Usually it's wise to only focus on one keyword idea per title. More and it can get convoluted for the reader and for Google. It is OK to stick local information, like a city, into the title where appropriate to reinforce that. Something like "Chicago's Highest Reviewed Plumbing Company" hits a target city, the keyword, and even sells the reader on why to click your link instead of someone else's — in this case being the highest reviewed. The page title is a promise you're making the reader. It's up to your content to fulfill that promise, but this is also why it's important that the title is clear. The reader needs to know what to expect from that page, and whenever possible sell them on the benefit of that page. Why do headlines like "Why J-Lo's Meltdown Will Ruin Album Sales" get so many clicks? They rely on shock. You see this and first think "Wait, J-Lo had a meltdown?" The target reader wants to know more. We don't recommend using trickery in your titles (a method called "click bait"), but the broad concept is sound. If you're selling landscaping services, simply calling a post "Landscaping Services in Florida" does little to entice a reader to learn more. "Why Landscaping Services Add Value To Your Home" is a stronger pitch, since you're selling a benefit to the reader. Sure, you'll still talk about the specific landscaping services you offer and build ranking for it, but you're inviting the reader in by saying "It helps you to learn about using this service." You're making it about them. When the topic is something where you can employ emotion, that will hook people even stronger. Remember, ranking is only part of the equation. That's getting people to see your site in search results, but we also have to persuade them to click on you and stay on your site once there. Next in DIY SEO, the page content itself. Since the title is a promise we've made the reader, we need to make sure that it's clear we're going to keep that promise in the first paragraph. People are usually in a hurry to get the information they're seeking. When they click a link they want to know it's going to deliver, so start direct and try to use the keyword in that first paragraph. This reinforces to the reader and to Google that this page/article is indeed about what the title says. We'll also need to reference that keyword occasionally throughout the content without overdoing it. When search engines continue to see a topic referenced in the title appear throughout the page, it continues to reinforce the page's relevance to that topic. However, too much saturation of the word and search engines will penalize the website for what's known as "keyword stuffing". When those words appear an unnatural amount of times, search engines know the only reason is to game the algorithm, which backfires. For example, avoid text like "Ohio's best used car sales dealership. When you're shopping for used cars, the thing to know about used cars is that they're far more affordable, making used cars the ideal choice for anyone. If you're looking for used cars, you should really come check out our selection of used cars." Don't write like this. Even aside search engine penalties, it reads terribly for the visitor. Terms like "keyword density" used to be more important than now. Keyword density was a ratio of the number of times a keyword was mentioned versus the total number of words on the page. Back then, a density of 1 to 3 % was ideal. It was enough repetition to reinforce the topic without incurring any penalties. These days search engines have become more sophisticated and better at reading context to determine what a page is about. That means the the number of times an exact phrase appears matters less, but when in doubt you can still stick to the 1-3% saturation. But because of contextual ranking, words like "used cars" and "great cars" may be somewhat interchangeable as far as reinforcing the page's association with cars. If you want to stick to the 1-3% ratio without doing math each time, just figure 1-3 mentions of the keyword every 100 words. Long text can look overwhelming if it's just one continuous block of information. Using subheadings, like H2 and H3 tags, can help visually break up the information and make it more skimmable. But it's also a notable component of SEO. Like titles, search engines look harder at subheadings than they do at body text to determine what the page is about. Consequently, keywords placed in subheadings are helpful. Again don't overdo it, and if you have several subheadings you may not want to place keywords in all of them. But if your page is using subheadings, definitely make sure some of them contain keywords. It's a missed opportunity otherwise. Search engines can see the code where an image resides in the content, but can't actually "see" the image. Alt tags help search engines understand what the images are about. For example, if you have a picture of you by a birthday cake, an alt tag like "Me on my 18th birthday getting ready to blow out candles." You guessed it: alt tags are also a worthwhile place to put keywords. To follow the previous exxample, if your target keyword is "used cars" and you've included a picture of a car, alt tagging it with something like "2010 Chevy Camaro - one of our hot used cars for sale" is a good way to be legitimately descriptive and further reinforce that keyword. The relative SEO impact of alt tags is minor, but it's simple to do so any image without one is a missed opportunity. As we said earlier, strong SEO is more about getting dozens of little things right rather than one action that makes a night and day difference. Meta data is information not directly visible on the page, but used by search engine crawlers to identify the page. Also, when those search engines display that given page in search results, the title and description you see is usually based on what's entered here. Even if you're not on WordPress and don't have an SEO plugin, most major development platforms include a section on their page editing screen for meta data. As such, you most likely will never have to code the meta data manually, so we won't cover it here. 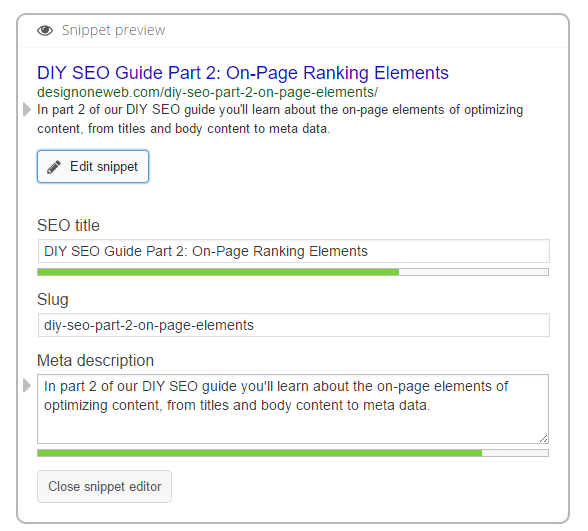 Often the meta title (sometimes called SEO title) will be very similar to the page title. The typical length limit is about 60 characters for a meta title, so if your page title is short you may elect to add some additional data. For example, if your page title was "Our Used Car Inventory" you may set a meta title as "Our Tampa Used Car Inventory | Company Name". Adding your city and company name in the page title might seem long and wonky for site readers, but it makes a lot of sense in a meta title to emphasize your local city and brand while still covering the page keywords. You can also specify templates in SEO plugins like Yoast and All in One SEO for meta titles to automatically input the page title, for example. That way in lieu of a manually entered title it will use the page title, but you can override that with your own whenever you want. But if you have a big website that's missing a bunch of meta data, the templates can be a great way to quickly ensure pages at least have meta titles — then you can optimize them further when you have time. The meta description is a short 140 character summary of what the page is about. Ideally it should also contain the target keyword, but should be worded in a snappy way to encourage searchers to click your result instead of the others. It's not a bad idea to put something enticing in there. If you have a store or product page and are having a sale, writing a teaser sentence about what you sell and including "15% this month!" at the end will give searchers an added reason to check it out. Phew! That covers the basics of on-page SEO. There's more to learn of course, but this should get you going creating optimized content that will rank. Using the keyword list you created in part 1 and these tips, you're well on your way to changing the course of your website.